100% Grassfed Dairy and Beef! While we never fed a large amount of grain to our cattle and two winters ago we went involuntarily grass fed for a few months (due to the silo being frozen shut), we officially went 100% grass fed last August in our dairy and beef cattle. We also started selling our milk under the Organic Valley Grassmilk label in November. So what does Grassfed mean? …ruminant animals be fed only grass and forage, with the exception of milk consumed prior to weaning. Animals certified under this program cannot be fed grain or grain by-products and must have continuous access to pasture during the growing season. On the dairy side there are no USDA rules (yet), so Organic Valley is leading the way in setting grass fed milk standards. 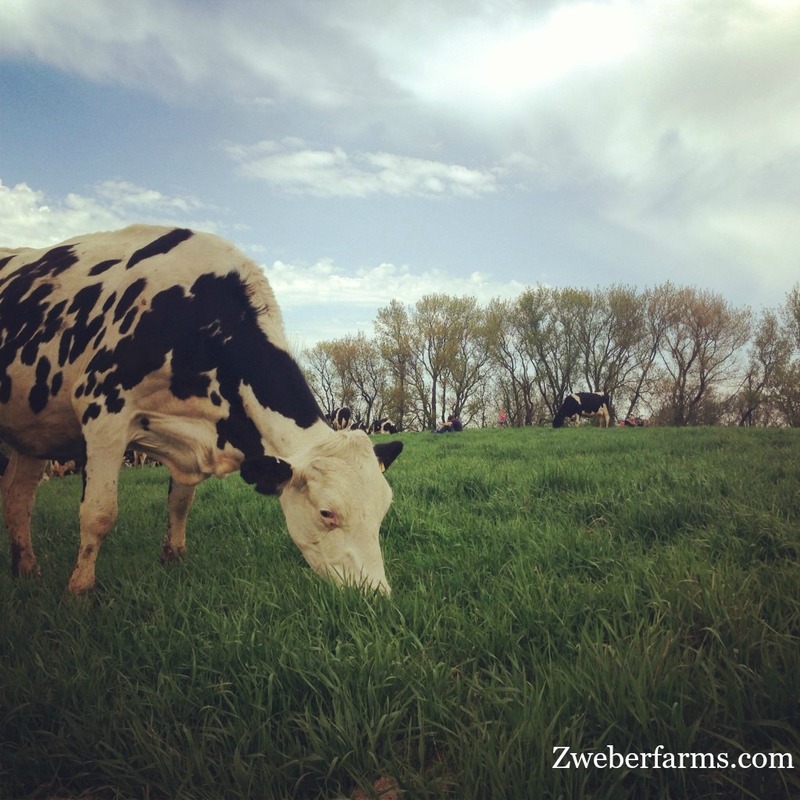 We believe the claim of “grass-fed” or “100 percent grass-fed” on dairy products must be meaningful and verified. This is essential to communicating honestly with consumers, ensuring market potential and promoting grass-based production systems. 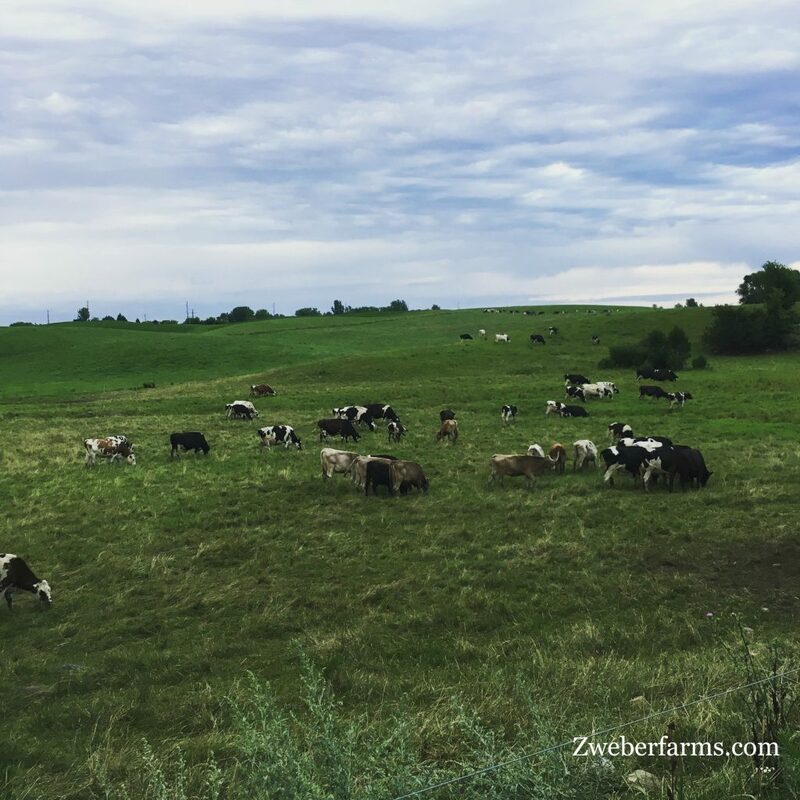 As processors, manufacturers, certification bodies, and retailers, our companies commit that any grass-fed claims on dairy products will comply with the 10 Principles for Grass-fed Dairy. We support the continued work to develop a unified, industry-wide grass-fed dairy claim. No grain ever. Cows eat a diet of high quality forages (pasture and hay) from birth. Feeding grain or grain by-products is prohibited. Pasture is a priority and maximized. Cows must get the majority of their feed from good quality and well managed pastures. Cows must receive at least 60 percent of their annual dry matter intake from pasture and graze for no less than 150 days a year. Access to the outdoors is a must. Cows must be provided outdoor access year round except when it jeopardizes the health, safety, and welfare of animals or would damage natural resources. 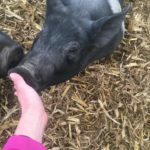 Animal health is first. Third party wellness checks or veterinarian oversight are required. These are not voluntary options – cows and calves must be healthy and all animals must be treated when sick. Stored forage and non-grain supplements. 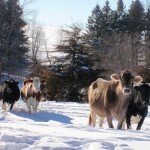 Cows and calves may be fed hay haylage, balage and silage in the non-grain stage. Essential vitamins and minerals as well as limited non-grain supplements may also be fed. NO antibiotics and NO growth hormones. Clear cow and herd entry requirements. Any cow or herd entry must meet the grass-fed principles for 60 days before the milk is accepted for “grass-fed” or “100% grass-fed” products. Good farm records. Auditable, common-sense records are essential to maintaining integrity for grass-fed dairy. Required records include: pasture management plans, use of feedstuffs, planted on-farm seed receipts, medications used and segregation actions performed, herd health plans, and traceable animal sourcing and lifecycle records. So this essentially means the cattle on our farm receive no grains, ever. What do Grassfed Cattle Eat? In the spring, summers and early fall, that is simple, the cattle eat grasses, legumes (clover and alfalfa), other forages, out on our pastures. 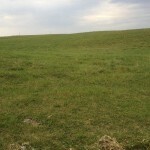 Typically, our cattle are out on pasture in the beginning of May and the grass keeps growing until October. In the winter, they eat grasses, legumes, and other forages that we made into hay or haylage. Haylage is fermented, chopped hay and served to the cows wet. Hay is dry and served dry in the form of bales. I’ll do another post on that later. Simply put, we make a great big salad for them twice a day. Cattle will eat about 100 pounds of food per day. That is a lot of food and we start with the hay and haylage making process in late May and don’t quit until October. As farmers, we also see how this way of farming as benefited our cattle too. Our cattle are healthy and athletic and we have few health problems. If you are interested in serving healthy, grassfed beef to your family you may purchase some right on our farm. We sell ground beef in the one pound packages and custom quarters or halves of beef animals. With the custom orders, you get to decide how you want your steaks, roasts, ribs, etc. 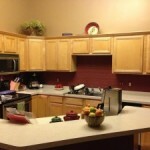 To learn more visit our prices page. You can always email us with questions at zweber@integra.net or give us a call at 952-461-3428. We are open every day. If you are looking to find our Grassmilk, Grassmilk cheese and Grassmilk yogurt, head to your grocery store. These products are fairly new and not available everywhere. I have found them at all the Minnesota food coop-stores. Also, ask your store manager to carry them and tell them you know the farmers who produce the milk. I hope that this helps answer some of your grassmilk and grassfed questions. I’m very excited to make you my new “store”! My good friend, Jeanne Mahoney, has been telling me about you and forwarded this notice to me. I believe she lives nearby. One question… do you take debit cards or checks? Thanks!